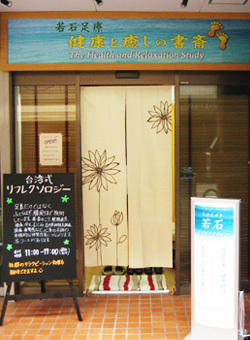 The "Health and Relaxation Studio" aims at producing beautiful literature and providing health and relaxation to customers using "RWO-SHR Health Method" reflexology. It is held by David Zoppetti, originally from Geneva, Switzerland, who has been living in Japan since 1986 and is both a novelist and an experienced professional reflexologist. 1)Improvement of the blood circulation and of the metabolism. 2)Activation and function restoration of the organs. 3)Improvement of the immune system and of hormonal balance. 4)Deep relaxation of the mind and the body. 5)Stimulation of the excretory process of toxins. For more information regarding reflexology treatments and prices, as well as opening hours, please call the "Study" at 03-3321-3872. David will be more than glad to assist you! Reservations please call or visit.